Research Project for evidence of life after death. Denise has worked as a Professional Medium, directly with local chapters of the following non-profit Support Groups since 2005: Project Help Crisis Center (Criminal, Sudden & Accidental Death) , The Victim’s Advocate for the Collier County (Naples, FL) State Attorney’s Office, The SAS Group (Surviving After Suicide), and Alcoholics Anonymous. Denise has also worked with: Lee County Bereaved Parents, Lee County Grief Group, Compassionate Friends of Lee County & Over Eaters Anonymous-All Groups located in Naples-Ft Myers, FL *Denise always works with these groups with the Group Counselor/Mental Health Professional present and also, directly with the counselor to provide further insight and interpretation of the group session. Denise also works with Wounded Warriors – on an individual basis, with Veteran’s and their families, who have lost a loved one in the Iraq/Afghan War. *In some cases Denise Volunteers her time, but Denise also offers a *discount for Veteran’s* on Private Sessions, please ask. Denise has extensive experience in working with and helping to facilitate healing for our Soldiers suffering with PTSD. Denise has volunteered countless hours since 2005 to many Law Enforcement Officers/Agents on local, state and federal levels and even in other countries, sometimes for the purpose of assisting criminal investigation’s and other times, for the purpose of bringing peace and healing to our First Responders who take quite a beating doing their jobs. Denise also consults for many people in the US Government, as well as, different branches of the US Military and Dept of Defense providing intelligence information on a wide variety of concerns in respect to National Security. Denise is also an “Endorsed Research Medium” and donates her time for a small donation, to the After Life Data Project, a scientific project which is researching and documenting proof and evidence of life after death. You can read more about this project by visitng the links on this website. *You can help by participating in one of the groups and your fee is used to help fund the project. 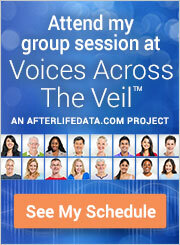 She has also participated, and continues to participate in countless scientific studies and research projects: http://www.psychicalresearchfoundation.com/ http://www.afterlifedata.com/ https://voicesacrosstheveil.afterlifedata.com/ to name just a few. *With most of these groups Denise volunteers her time, or in some cases, offers her services for a small donation. Since 2005, Denise reads regularly for several Non-profit Grief support groups, always with the grief counselor present. In these groups she reads for family members who have lost loved ones by sudden & accidental death, homicide, suicide, overdose and traffic accidents. She reads for children and adults, communicating with their loved one on “the spirit side of life” providing a last word or conversation, many times previously unknown or missing information, and most importantly closure. *These are all confidential organizations and Denise is never told the names or the circumstances of thie individuals prior to or even after the readings. *Denise regularly volunteers her time for this work for groups, individuals and families. 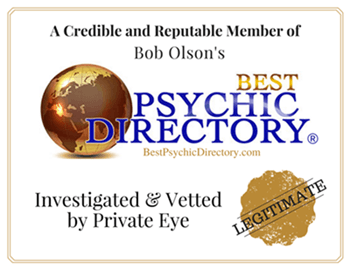 Find more statements from some of these groups on the “Testimonials” page. Denise is also regularly commissioned to assist in the investigations of criminal, accidental and unsolved death incidents. Utilizing her abilities as a Medium & Medical Intuitive, her work also includes Reading for Addiction Recovery Support groups, with their Recovery Sponsor present, and Reading for the specific purpose of gaining insight into the many facets of Addiction. These programs are unprecedented and have been very successful, the clients and counselors both, have testified to the fact that the readings significantly help to accelerate the healing process for Grief and Addiction. Connect with and Follow Denise on Twitter, Facebook and YouTube!